Today we are lucky enough to have Tiffany with us Guest Blogging from Lifestyles of the rich and "not so" famous - she is an amazing person who was willing to share with us all her story. Please take a moment to read her post, visit her site, and feel free to leave comments in response on our Facebook page. 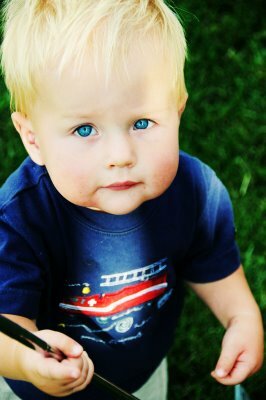 On Tuesday, September 23, 2008 our most precious baby Jackson was called home to our Heavenly Father. He was 1 year, 4 months and 3 days old. At approximately 1:30 pm, our little Jack fell into our 12 inch deep pond in our backyard and unfortunately, drowned. Though kind neighbors and paramedics worked for over 50 agonizing minutes to bring our baby back it was only for a few hours. They were able to get his heart pumping again, but his little lungs were too saturated to be saved. One good thing was able to come of this. Jack had a strong heart in more ways than one. We felt impressed to have his valves donated to help save someone else's little angel. If we could save one mom and dad from standing in front of a little white casket asking the Lord "why? Why OUR baby? ", then it would be worth it. We were told that Jack is helping to save not one but four little babies born to damaged hearts. He was our pride and joy (along with our oldest son Corbin, 3 years old at the time of the accident) and we will miss him more than words can describe. He was our sunshine, our ray of sunshine. Those eyes, that smile. Oh, we will sure miss him. It will be the hardest thing Coby and I will have to do we pray. But feel some peace knowing KNOWING that we will see him again. KNOWING that through a loving Heavenly Father we'll have the opportunity to raise him again. We WILL see him again and with that knowledge while it doesn't take an ounce of the horrible indescribable pain away, gives us hope. People from everywhere seemed come out from all parts of the world to offer us comfort. A large donation was given to us by the sweet ward members (I belong to the Church of Jesus Christ of Latter-Day Saints) and a memorial fund was set up at our Credit Union. So many generous people sent cards, flowers, donations, gifts, words of comfort, a listening ear, meals for almost 2 weeks, treats, books, different blog sites, the list goes on and on. Friends flew in from all over. They dropped everything they were doing to be there for us in our time of need. Our families on both sides put their feelings aside and did everything they could to help us. Laundry was done, dinner was made, the house was cleaned. Our best friends took many of the last pictures we have of Jack and enlarged them, framed them and drove them down to us from Logan. I am so thankful that she was able to capture such tender moments of our little Jack. We will always treasure them. Our ward family was truly amazing. So many wonderful people served us so kindly that we are sure that we will never be able to give you what you have given to us. The friendships that have been created are now permanent and we truly feel like we belong. I'd love to personally thank every single person that gave of their time, energy and efforts so selflessly. Many were anonymous and I pray that they will get the reward they deserve by our loving Heavenly Father. Mothers who had lost their own little ones took time to call me and console ME during even their darkest hours. Pictures of Jack and our family were printed, enlarged and framed. Two gorgeous albums were completely scrapbooked with pictures of Jack during his entire life. Loved ones dropped by daily, sometimes more than that to show that they were thinking of us and show us that they loved us. Friends and family stepped up in such a way as I have never seen. I know that there are countless other tender mercies (see Tiffany's blog here) that I have failed to mention. I know that the Lord loves us, that he cares for each of us individually. That He knows us individually. I know that He knows the Plan much better than I could ever hope to. I feel peace knowing that while Jack's time was short he is with a loving Heavenly Father and is watching over us. I feel his presence and know that Jack is a truly special son of God. I feel privileged to have had him as my son despite the length of time. He is still my son and I KNOW that I will see him again. I KNOW that I will have the opportunity to raise him if I'll only prove worthy. I am grateful for this knowledge. I am grateful for the gospel of Jesus Christ. The Atonement has an entirely new meaning in my life and how I view things. How selfless our Savior is to suffer so that we could return Home again. I am grateful that the Lord didn't step in and remove that bitter cup, despite how difficult it must have been. How hard it must have been for Him to watch His only begotten Son suffer. And yet loved us so much that he was willing to sacrifice that which was most precious for the better good. I love my Father in Heaven and his Son, Jesus Christ. I am so grateful for the knowledge of the Plan of Salvation and that we are sealed together as an eternal family. I am grateful for such a wonderful husband who could have easily blamed me for not paying attention that awful day, but chose the higher road. Chose to love me and trust me that it wasn't my fault. I am grateful for good friends and family that love me unconditionally. I feel such gratitude despite our current circumstances. And I know that if we endure this trial well, that we will be exalted from on high. I know that the Lord answers our prayers. I am reminded of what He told the Prophet Joseph Smith when he suffered with his companions in the smothering darkness of Liberty Jail: “My son, peace be unto thy soul; thine adversity and thine afflictions shall be but a small moment; “And then, if thou endure it well, God shall exalt thee on high; thou shalt triumph over all thy foes.” In the words of Elder Joseph B. Wirthlin of the Quorum of the 12, "The Lord compensates the faithful for every loss. That which is taken away from those who love the Lord will be added unto them in His own way. While it may not come at the time we desire, the faithful will know that every tear today will eventually be returned a hundredfold with tears of rejoicing and gratitude." I am grateful to know of these truths. I love this gospel, am grateful for it, for my family, friends, my Savior and my Heavenly Father.